Our corporate sexual harassment training is ideal for employees who need an workplace sexual harassment as part of a preventative skills training or as a requirement of a disciplinary action. Our online sexual harassment classes are available to the employee 24 hours a day and 7 days a week from any computer with Internet access. This online sexual harassment class can be taken on-site and monitored, or off site at the employees’ discretion. We offer our classes in two languages, both English and Spanish for native spanish speakers. All classes are timed and every employee is required to pass short quizzes before they are able to move to the next lesson. Each employee is also monitored with an employee “log”. This log will show their progress though the course including which quizzes were passed and how much time was spent on each lesson. It will also show the time they logged in and out of the program. Once the employee finishes the course, a Certificate of Completion will be mailed to the employer. Sensitize supervisors about discriminatory harassment and their critical role. Reinforce that supervisors are responsible for identifying and helping to prevent discriminatory harassment in the workplace. Create a workplace environment where potential victims of discriminatory harassment can discuss their concerns without legal retaliation. To register for our corporate sexual harassment classes click on the button below. If you have any additional questions, please Contact Sexual Harassment Class or call our office at (949) 715-2694. $45.00 for a single class. 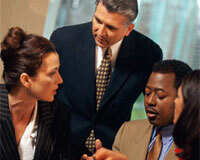 This page is for corporations seeking sexual harassment training for your employees. If you are an individual seeking our online sexual harassment training, register for an individual Sexual Harassment Program.